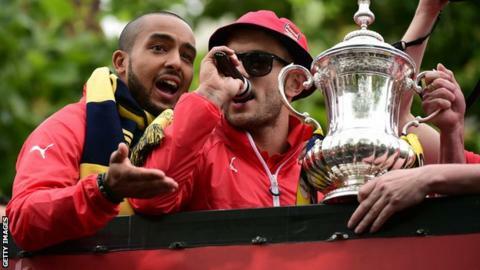 Arsenal will not be taking any action against Jack Wilshere for singing anti-Tottenham Hotspur songs during the club's FA Cup trophy parade. The midfielder was reminded of his responsibilities as the club's media channel had to apologise mid-broadcast. Wilshere, 23, led fans in an expletive-laden chant after the Gunners won their 12th FA Cup final with a 4-0 thrashing of Aston Villa at Wembley. The England international did similar after their 2014 FA Cup final win. Wilshere came on as a substitute against Villa, with goals from Theo Walcott, Alexis Sanchez, Per Mertesacker and Olivier Giroud making the London side the most successful club in the tournament's history. Retaining the crown allowed manager Arsene Wenger to clinch a record-equalling sixth triumph in the world's oldest cup competition.